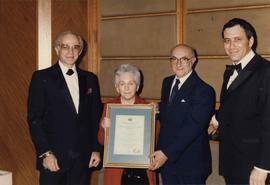 Photograph depicts four unidentified people with a framed certificate.Written on verso: "JNF Feb. 24/83. 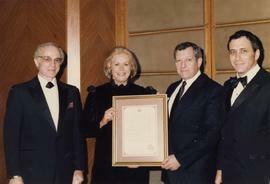 'P'"
Photograph depicts four people with a certificate. The couple receiving the award are possibly Irving and Marcie Sirlin.Written on verso: "'V' 120%"
Photograph depicts three unidentified people with a certificate.Written on verso: "JNF Feb. 24/83. 120% 'S'"
Photograph depicts two men, one of whom is John Eskin and the other may be Eli Harchmi [unclear which is which]. One man is holding a framed certificate. Photograph depicts an unidentified man and Joseph Cohen shaking hands on stage. Photograph depicts Alec Jackson being given an award at a convention in Phoenix in 1968. Photograph depicts Alec Jackson presenting awards to a group of unidentified men at a convention in Phoenix in 1968.